Have your pancakes and your healthy too! 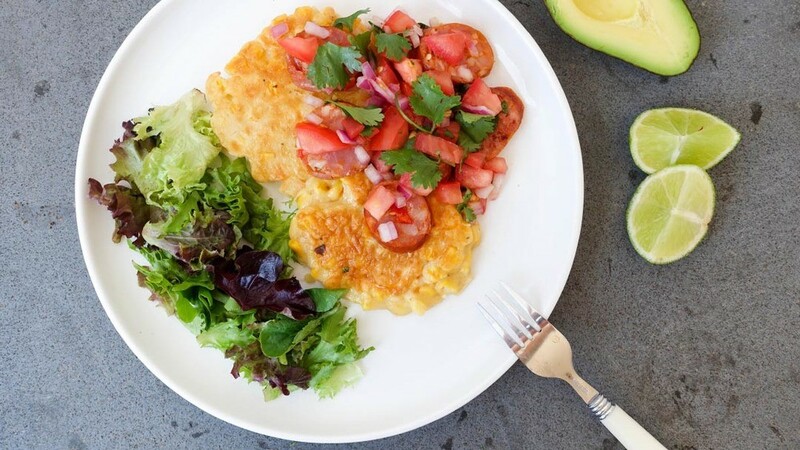 This quick and easy recipe for corn pancakes with chorizo salsa is delicious. Pancakes never tasted so good! In a large bowl, mix together the flour, salt, egg, and milk until just combined. Drain the corn kernels and fold them into the pancake mixture. Season with pepper. Heat 2 teaspoons of olive oil in a frying pan over medium heat. Use a spoon to drop 2 tbs of batter (per pancake) into the pan, and flatten to form a small round pancake. Repeat with the remaining batter, adding more olive oil if needed. The mixture makes 4 pancakes in total, I like to cook them in 2 batches. Cook the pancakes until golden, about 3 minutes each side. Remove to a plate. While the first batch of pancakes is cooking make your salsa. Finely chop the tomato, onion, chilli (deseed the chilli first if you don’t like things hot) and coriander, put all the ingredients in a bowl and squeeze the juice of half the lime over the top. Cut half an avocado into slices. While the second batch of pancakes is cooking. Heat 1 tsp of olive oil in a small fry pan or saucepan over medium heat. Slice the chorizo into rounds then add to the pan frying lightly for 1-2 minutes. Remove from heat. Place 2 corn pancakes on each plate, then divide the chorizo and salsa between each plate. Serve with avocado, mixed leaves, and the remaining lime cut into wedges.